The Romano-British villa at Butser Ancient Farm, completed in 2003, is a replica of one discovered at Sparsholt near Winchester and excavated in the late 1960’s . We are now involved in installing a mosaic floor in the reception room inspired by the splendid 4th century original – pictured above – which resides in the Winchester Museum. Our laying technique and materials are experimental and experiential. 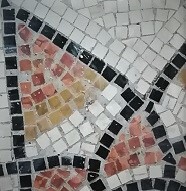 The techniques we use to create the mosaic and the materials used to bind them to the floor have been chosen to further our understanding of historical practices. Lime mortar will be used in the mosaic’s construction. Unlike modern cement this material is ‘faithful’ to Romano-British technique. Over the course of the project we will vary the types of lime and other ingredients in the mortar to help us examine which mixes are optimal for both laying and durability. This floor, like its Sparsholt ancestor, is to be walked upon. Unlike its predecessor, though, we expect tens of thousands of feet each year… hence our interest in durability! While modern replica mosaics have been constructed in Britain and elsewhere across the ‘Roman world’ (as well as many painstaking restorations of originals), we believe it is unusual for them to be laid by the ‘direct method’. That is, straight onto the floor. Lawrence Payne of Roman Mosaic Workshops is helping guide us through the project and he believes this to be the first large scale, direct-laid ‘Romano-British mosaic since the legions left. Most others are laid on segments of board, only later placed on a floor. The direct method is (as our crew will confirm) more physically demanding. Archaeological evidence suggests that a large proportion of geometric mosaics were laid using the direct method. Detailed figures and portraits, on the other hand, appear to have been laid via the indirect technique. Among our objectives in recreating the mosaic is to allow us to experience some sense of what working conditions were like for the makers of Roman-era mosaics: who knows, perhaps we can even foster a sense of camaraderie with the mosaicists of 1600 years ago. Of course we also aim to take the Butser villa a step closer to the original. Unlike the 4th Century, though, this mosaic doesn’t involve the use of slaves. Instead a dedicated team of FABULOUS volunteers are on their hands and knees laying the new mosaic. The team includes volunteers from Liss Archaeology and Bignor Roman villa as well as Butser Ancient Farm volunteers and staff. This won’t be a tile-for-tile (or tessera-for-tessera) reproduction of the original. The hand-cut marble cubes we are using are a substitute for the original native stone and terracotta. The aim is to reproduce the original design, dimensions and colours as closely as possible. At about 8000 tesserae for each square metre of floor, there will be about 86,000 tiles in the central geometric design section and another 30,000 larger tesserae in the surrounding single-colour border. The team at Butser Ancient Farm have also been repainting the villa inside and out to enhance the rooms and give visitors a stronger sense of what it would have been like to visit a villa during Roman times. The bright colours and geometric designs would have created vibrant interiors that are startling to visitors today and will be complemented by the colour and bold designs of the mosaic. Work on the mosaic will continue throughout the summer at Butser Ancient Farm, and visitors are welcome to come and observe the progress. There will be a series of talks for visitors to explain the ideas and techniques behind the project. The team at Butser Ancient Farm appreciate the support they have received from the Winchester Museum, Fishbourne Roman Palace, Bignor Roman Villa, Liss Archaeology and South Downs National Park. Each of our organisations showcases significant elements of Romano-British history and heritage and this project is facilitating a co-operative approach between all stakeholders to help foster a broader public understanding of the fantastic Roman heritage of Hampshire and West Sussex. Butser Ancient Farm would like to especially acknowledge South Downs National Park for their generous support through the Sustainable Communities Fund.